Silk — elegant, versatile and washable. Yes, washable! Sewing and dyeing silk was something I wanted to try. Silk is a natural protein fiber (like wool) that is taken from the cocoon of the silkworm. Most animal protein fibers require acidic dyes which are different than the alkaline dyes that plant fibers like cotton require. However, silk is less sensitive to high pH than other animal fibers, which makes it the most versatile of all fibers for dyeing. Silk can be dyed with acid dyes (specifically made for animal fibers), but it can also be dyed with fiber reactive dyes (such as Procion dyes). 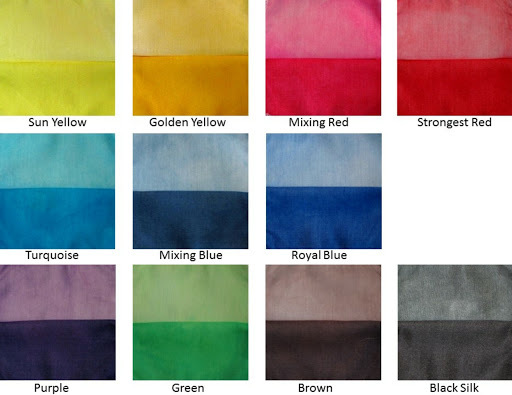 Looking over the many approaches for dyeing silk, I decided I did not want to invest in yet another set of dye powders. So, I looked for directions that used the Procion MX dyes I already had. I found two different dyeing methods to try. 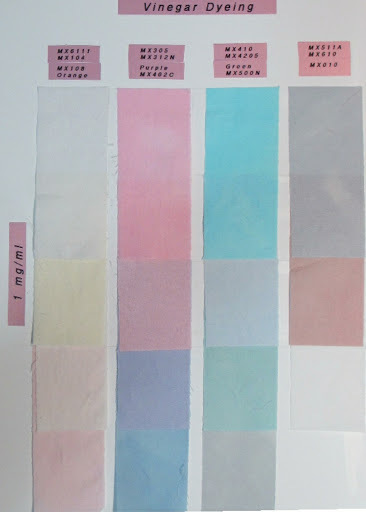 Similar to dyeing cotton, silk can be dyed using the soda ash method. With this method, the soda ash acts as a mordant to bind the dye to the fabric. The only drawback to this method is that the soda ash is alkaline and thus will make the silk slightly less shiny and not as crisp. While others may find the loss of the crisp silk texture a disadvantage, I actually prefer softer fabrics for making quilts, garments and other household items. 1) Soda Ash Solution – 1 teaspoon salt, 1 teaspoon soda ash in one cup distilled water. 2) Make Dye solution by diluting 100 mg of powdered dye in 50 ml Soda Ash Solution. Mix well. 3) Add 5″ x 5″ fabric square. 4) Cover and store at RT for 3 hours. 5) Rinse, wash with Blue Dawn and dry. To avoid the loss of shine, fabric can be exposed to an alkaline solution for only a short period of time. Thus to dye the fabric, an acidic dye solution is needed. Vinegar contains 5% acetic acid and as an acid it will bind the dye to the fabric. But, to lock the dye, the fabric requires heat. 1) Soak 5″ x 5″ fabric square in Distilled White Vinegar for 10 minutes. 2) Make Dye solution by diluting 100 mg of powdered dye in 50 ml Vinegar. Mix well. 3) Place fabric and dye in microwave safe container and cover with plastic wrap. 4) Microwave for 30 seconds, wait two minutes, and microwave 30 seconds again. 5) Cool for 5 minutes. 6) Rinse, wash with Blue Dawn and dry. I liked this second method – its fast and creates beautiful colors. Here are the samples created using 2 mg/ml and 0.2 mg/ml dye solutions. Now I need to figure out what to make with these truly beautiful pieces of silk fabric I have dyed! I liked the vinegar method for dyeing silk because it was really fast. So, if it works for silk – will it work for cotton? Sadly, the answer is No. The results show that the dye intensity is only about 10 percent of the intensity created with the soda ash solution. This should not have surprised me since cotton is a plant fiber not a protein fiber. But, it was worth a try.